As creatures made in the image of God, we were made to worship. Our chief goal is to move our hearts to that place of ultimate worth, seeking to know the Almighty God who created heaven and earth and who made himself known in his Son, Jesus, the Saviour of the world. All that we do is meant to honor Jesus and through him, to glorify our heavenly Father. To be followers of Jesus, preaching and teaching the timeless truths of God's Word are central to our life and worship. In addition, sacraments are the outward signs of God's inward grace. Following Jesus' example, baptism is the essential and full initiation to the Kingdom of God. Both children and adults are eligible for baptism. Being a sacred adoption, the whole community celebrates the glad event. 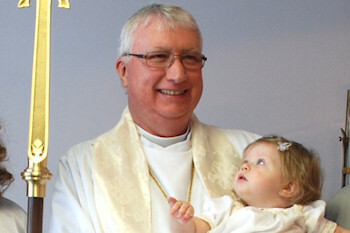 Baptism does require some preparation so all those wishing to be baptized should contact the priest. In the Episcopal church our Sunday worship centers around the Eucharist or Holy Communion. This sacrament was commanded by Christ as his remembrance until he returns. Our communion table is open. All are welcome to the feast. There is no one who has too many doubts, too few beliefs or has stumbled too many times. Our altar is the table of a loving God, a table that is set to feed all creation through the love of Jesus Christ. We are here for you - come and be fed.